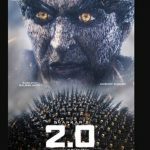 The video of the making of the Tamil film 2.0 is already trending hours after being released, thanks to the superstars who feature in it, as well as fans who are now awaiting the Enthiran sequel. 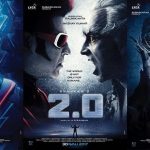 Looks like Rajinikanth and Shankar are definitely making a comeback, only this time, they are joined by Akshay Kumar, who is in a never-seen-before avatar. In the one and a half minute-long glimpse released, Rajini takes over from exactly where he left us in the first movie. 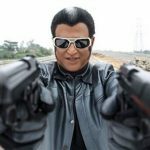 Seven years later, the superstar looks almost similar to his role in Enthiran. The makeup, the body language and all of the stunts in this video make for the ultimate flashback Friday moment of the month. Though one cannot stop talking about Thailavar and his presence, what wis bound to take the audience by surprise is Akshay Kumar. 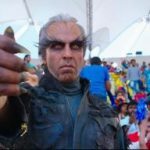 Apart from Rajini, the making of 2.0 is all about the Bollywood actor’s tryst with south cinema and his evil look. Akshay Kumar is convincing as the bad guy, and glimpses from the set have definitely got us curious. Excitement for the two to face-off just increased — this is one of the most spectacular protagonist-antagonist duos on screen. We also get to watch Amy Jackson on set, who makes a pretty appearance in red. The actress replaces Aishwarya Rai, who starred in the first installment. There is also S Shankar, who is seen busy directing in his trademark style. Multiple technicians working on what looks like humongous sets, top-notch makeup, stunts and VFX. Evidently, the making video has revealed that Shankar is once again working on a larger-than-life script. AR Rahman too, makes an appearance with Rajini and Akshay Kumar.